Very successful as a niche problem-solving tool, but not versatile enough to work as an all-purpose, everyday de-esser. Excellent at fixing strong sibilance. Good for avoiding lisping effect. Uncluttered interface. Separate sibilance filtering controls. Can be tricky to set up. Initially confusing. Can undesirably reduce sheen. It's hard to fall in love with a de-esser. Like toilet paper, though, while you might not love your de-esser, you do undoubtedly need it, so you want it to be comfortable to use and effective. 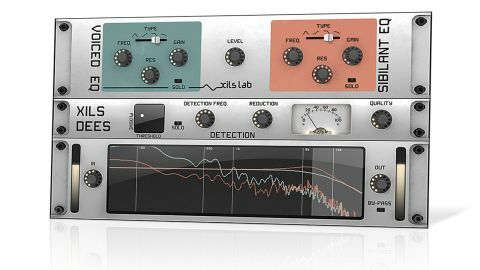 With its new de-esser plugin, DeeS (VST/AU/RTAS/AAX), XILS- lab hopes to cater to both of those requirements. De-essers typically work by duplicating the input signal and using the 'copy' as a selectively filtered (around 8-10kHz) sidechain trigger, which reduces the level of the signal when those harsh frequencies reach a certain level. "DeeS works by detecting sibilance, then totally separating those frequencies from the rest of the sound"
You can actually make your own de-esser by running the same signal in parallel on two channels: one unheard with an EQ isolating sibilant frequencies, and the other audible, with a sidechained ducking compressor triggered by the EQ output. But DeeS is a little more sophisticated than that - as you'd expect! It works by detecting sibilance, then totally separating those frequencies from the rest of the sound, enabling you to EQ and balance the two elements separately before recombining them. DeeS has three main sections to its signal flow, the first of which - the Detection section - is, confusingly, located in the middle. Here, you sweep the Detection Frequency control to home in on sibilance, with the Solo button letting you hear it in isolation. There's also an adjustable Plosive threshold for establishing how DeeS reacts to plosives ("B" and "P" sounds), and a Quality knob - a response speed control for smoothing or sharpening the detection's attack (particularly useful on percussion). The Reduction knob controls how much of the sibilant signal is separated from the main signal. The top section hosts two multimode (bell, high-pass, low-pass and smoother low-pass) resonant filters with Gain controls, for processing the sibilance (Sibilant) and 'main' (Voice) signals separately. This gives you the option of EQing the sibilance to soften it, rather than just attenuating it, helping avoid the lisping effect caused by extreme de-esser settings. The central Level control can be used to boost sibilance, and can actually increase definition and edge. At the bottom is a graphical display showing the set sibilance frequency range, the frequency curves of the two filters and the real-time frequency spectra of the Sibilant and Voice signals, as well as Input and Output level controls with level metering and peak indicators. DeeS is undeniably powerful, but, despite the clear layout, it's not the most intuitive or quick plugin to set up. More importantly, at anything approaching high reduction settings, it has a tendency to reduce the overall brightness noticeably more than many of its competitors, making it less suitable for that modern, ultra-shiny vocal sound. DeeS proves itself to be excellent at one thing, however: fixing extremely problematic vocal recordings without generating the dreaded lisping effect. In this regard, it'll be useful for engineers handling live recordings and badly recorded vocals. Ultimately, DeeS is a very specialist de-esser and repair tool, but if you're producing contemporary electronic styles, don't expect it to be the only de-essing plugin you'll need.